Original cover art from GENE AUTRY , a Little Golden Book published by Simon and Schuster in 1955. The artist is Mel Crawford. Crawford is truly one of the great illustrators of our time. He is well known for his work for Whitman Publishing. He did many Little Golden Books like Howdy Doody and Little Lulu and Yogi Bear. He also worked for the Disney Studios and Sesame Street. This is a fine example of one of his Little Golden Book covers. Piece measures 14 X 16.5 inches. Art measures 11 X 13 inches. 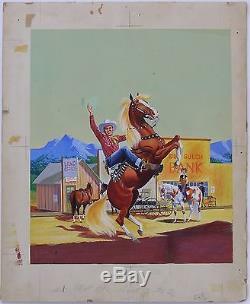 The item "Original Art by Mel Crawford Gene Autry, cover of Little Golden Book, 1955" is in sale since Friday, March 28, 2014. This item is in the category "Collectibles\Comics\Original Comic Art\Paintings". The seller is "amazing-adventures" and is located in San Francisco, California. This item can be shipped to United States.